The most common sea star (they aren't called starfish anymore!) 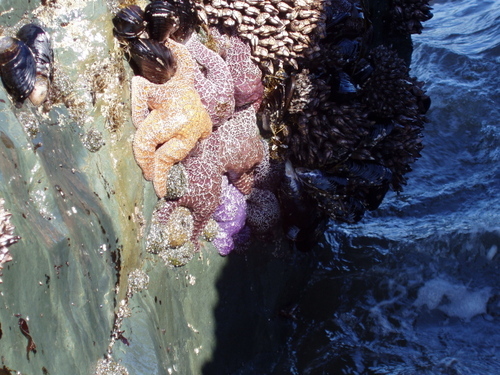 on the southern Oregon coast is the Ochre Star (Pisaster ochraceus), which can be spotted from a distance due to their bright colors, relatively large size, and the fact they live near the low-tide line on exposed rocky shores. All sea stars have hundreds of tube feet located in two rows on the underside of each arm. Stars use these tube feet for locomotion and to capture prey. 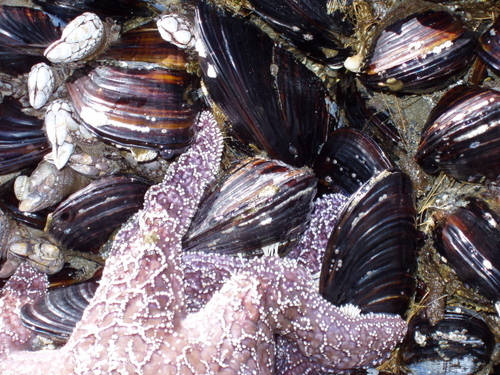 In the photo below, a few tube feet are visible (the fine white threads extending from star's far-right arm) attached to the shell of a mussel, the Ochre Star's favorite prey. 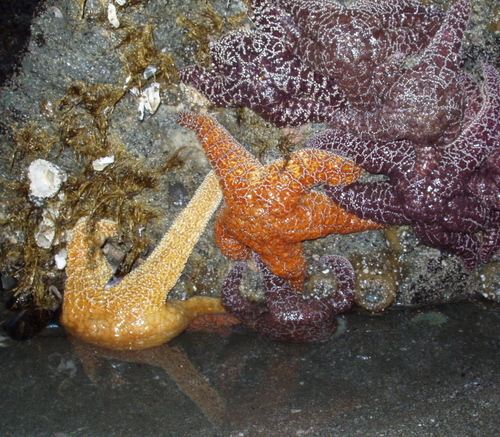 Biologists have recently discovered a pair of "duo-glands" at the tip of each Ochre Star tube foot. One gland secretes a "glue" allowing the star to adhere to a rock indefinitly, or pry apart prey. When the star is ready to move about or finished consuming its' prey, the second gland secretes a substance that dissolves the "glue." Sea Stars have the ability to regenerate a new arm(s) when they lose one or more to predators or mishap. In controlled experiments, biologists have been able to regenerate five complete, new sea stars from the five severed arms of one Ochre Star. 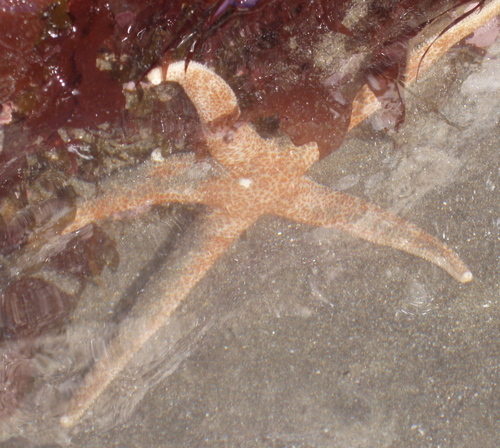 Troschel's Sea Star (Evasterias troschelli), also called the Mottled Star, resembles an Ochre Star, though the Troschel's arms are much more slender and its' central disk is much smaller. Also, the whitish spines on Troschel do not form a pattern as they do on the Ochre Star. Please note the round white spot near the center of the central disk (photo below). This perforated plate is called the "madreporite" through which water can be taken into the sea star's body and pumped through its water- vascular system. 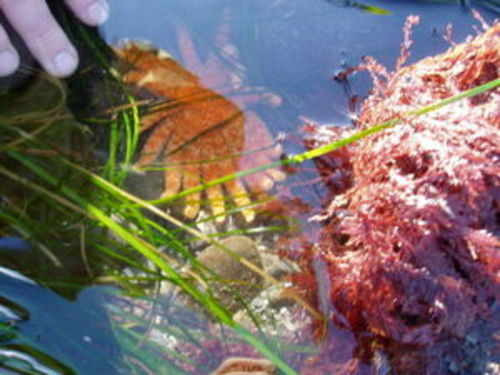 The water-vascular system is connected to the star's tube feet and its' ability to move about the tide pools and capture prey. 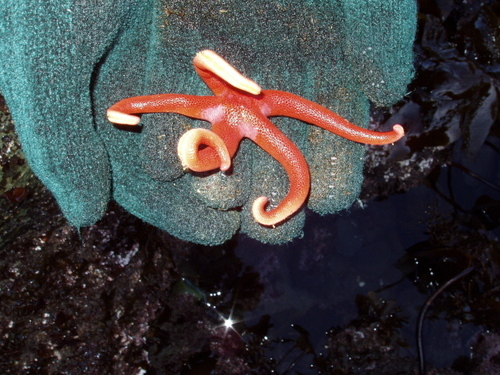 A sea star's mouth is located on its underside. To eat, the star extrudes its stomach through its mouth and wraps it into or around its prey. The stomach is thinner than a piece of paper and can be inserted into the tiniest of openings to digest a mussel or other bivalve. The star digests its' food externally before swallowing it. 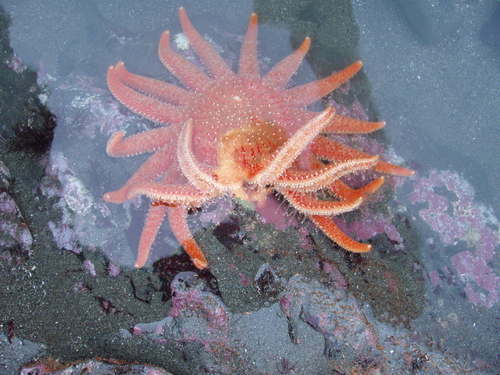 The Stimpson Sun Star (Solaster Stimpsoni) is usually found only at the very low-tide line, and it is thrilling to find one of these rare beauties. 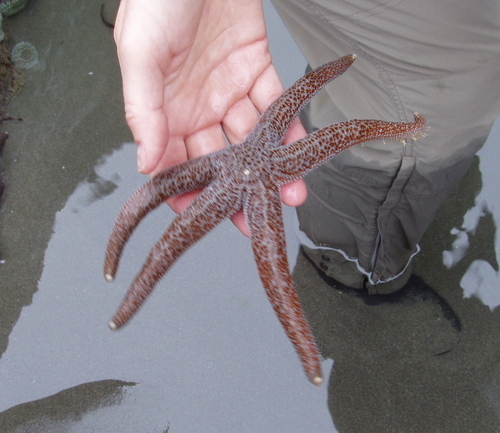 We found this Stimpson Sun Star north of Gold Beach at Sisters Rocks. It is a voracious predator and its favorite prey are sea cucumbers. The Stimpson Sun Star typically has 10 arms, and can grow up to 20" in diameter. This speciman had 11 arms but was only 10" in diameter. What it lacked in size, it more than made up for in its spectacular coloring! 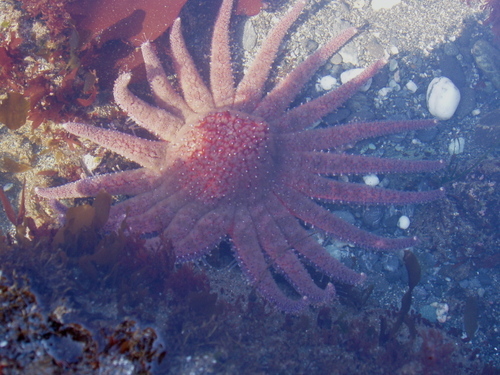 We found our first Stimpson Sun Star in 2007 (below) with its arms wrapped around a sea cucumber....its favorite meal. This one wasn't nearly as colorful as the one we recently spotted (above), but it did have the signature bluish-gray lines down each arm. Even though the small Blood Star (Henricia leviuscula) grows to only 3-4 inches in diameter, its shocking red color makes it highly visible, even from a distance. 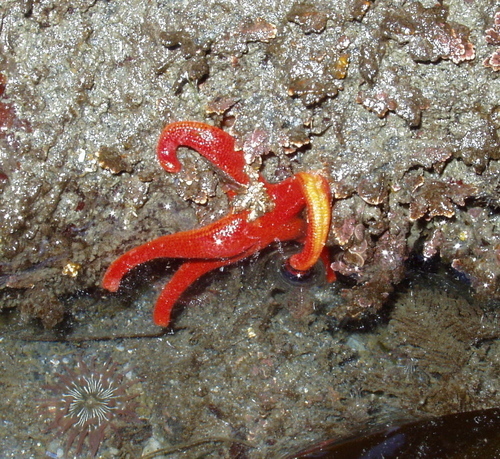 The Blood Star feels very leathery to the touch, and can often be found hanging off a rock by only one or two arms. We have only found Blood Stars in protected rocky areas covered with sponges and bryozoans..their preferred choice of meals. The Pink Star or "short-spined star" (Pisaster brevispinus) looks very similar to the Ochre Sea Star, but the spines on the star's back are much less noticeable. 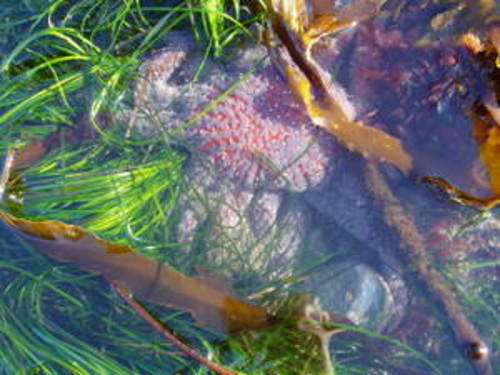 Pink Stars eat barnacles, mussels, tube-dwelling worms, and rock-boring clams. The tube feet (the white projections on underside of arms), used for locomotion and capturing prey, are very noticeable in the photo below. We have found Pink Stars occasionally at Secret Beach (milepost 345.5 on Hwy. 101), and all but the one in the photo below have been much larger than Ochre Stars....this one looked like a baby. Bryan has the star turned over on its back. The yellowish lines on the underside of each arm are its tube feet...hundreds of them.